Our mission team of twenty-three people from Cornerstone Community Church in Galax, Virginia has enjoyed serving Nicaragua this week. We are grateful for the roots Because We Care Ministries has planted here that have allowed us to fellowship and serve thousands of miles away from home. Some in our group have been here multiple times before, for some it was the first trip, some are kids, some are teenagers, and some are grandparents, but we were able to join in love for the sake of the gospel. Goodbye will be difficult, but the people of Nicaragua have filled us with a joy we will never forget. Our team arrived to Managua on Friday night. Saturday allowed us a full day to embrace the entire Nicaragua experience. We visited Volcano Masaya and explored the city of Grenada. The day gave us an opportunity to bond as a mission team. There could be no better display of God’s power than overlooking an active volcano, beginning the week with a worship-filled perspective. On Sunday, we quickly dove into worship and serving when we arrived at Casa De Shelly in Somotillo. Seeing the spirit of worship in the people here through a village worship service we provided in Las Liras de Paso Hondo and through church at Principe de Paz Baptist Church was a highlight of our week. There is unity in the body of Christ that gives us the power to come together to worship our God, even in different languages. The radio was down this week, but we didn’t let that to stop us from sharing our testimonies and worshipping together. We spent each morning sharing our stories and singing as a mission team here at Casa De Shelly. The men of the group worked hard Monday through Wednesday morning on preparing the floor and laying block on a house for Ms.Virginia, a deserving woman in need of a home. Meanwhile, the women visited the schools of Casablanca, Pascuala, and the Baptist School at Principe de Paz to engage with the children, share the gospel, and give them school supplies. On Thursday we all were able to visit door-to-door in the village of La Barrera. Mr. Don led us through a gospel training class throughout the week and we were able to apply what we learned to extend God’s love to the people we met, pray for their families, invite them to church, and give them food. We visited a different village each afternoon to show love, play with the children, give a hot meal, share the Good News, and provide medical care. 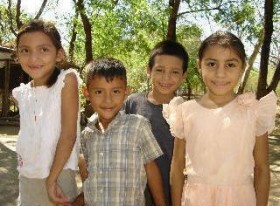 We were blessed by our visits to the villages of Cana Fistola, La Flor, Las Mesas, and Villa Esperanza. Our team was overwhelmed by the joy of the people here. Though their lives are full of hardship, they are content and happy. We loved seeing the smiling children waiting by the road as we threw candy and clothes from the back of the truck. Each of us will leave with a suitcase full of special memories. As Mr. Don has told us many times, blessings follow obedience. We have truly experienced many blessings this week. Though we came to serve the people here, they have served us with their faith, love, and gratitude. We look forward to returning home to continue our mission. Just wanted to do a follow up to the letter that I sent out yesterday. The student support is still $250.00 per year not month. We have learned that the administration of the school is really a hand full. Please forgive us for a lack of follow up and information to those that have sponsored our students. If you have sponsored a student in the past and would like to continue please contact us and will get the up dated info to you as soon as the children return to school. We are also seeking an individual to HELP us with the administrative part of the program in the future. Good morning and blessings…..I’m writing to you this morning concerning BWCM’s need for Pascuala school support. Since you have helped in the past we wanted to make our needs known. We will be adding an 8th teacher in 2017 so that we can reduce the size of some classes. We are continuing to seek student sponsorship ($250) per month but have to seek TEACHER support as well. We are expecting to enroll 56 students in elementary and more than 100 in High School for 2017 which begins in early February The student sponsorship will only cover uniforms, food and supplies. Attached is a letter (translated) that I received last week outlining the budget for 2017. We are seeking churches and individuals willing to take on 1 or more months of sponsorship. THANK YOU FOR YOUR PRAYER, PARTNERSHIP AND SUPPORT. Paul wrote a very specific THANK YOU letter to the church to give thanks for their support of him. Pam and I want to specifically thank you for your prayers and support. One of the great Old Hymn’s written by Johnson Oatman in 1897 and sung in churches around the world daily. This time of the year we begin to take a glimpse back to praise GOD for all the many blessings and all that HE has done. Don’t only GIVE THANKS for what HE has done but also give thanks for allowing us to be apart of HIS mighty work. 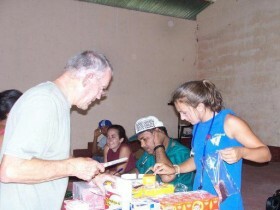 I praise HIS Holy Name for all the missionaries HE brought to Nicaragua, the homes HE built, the food HE provided, the medicine HE provided, the school HE guided, the Nationals that were given an opportunity to learn the WORD of GOD and all the Nationals that ask CHRIST into their hearts. I’ll have to say that 2016 was one for the ages. In a couple weeks 2016 will be in the history books. We have been praying already for 2017 and where GOD would have us go and do. I’d like to share a few prayer request that you can pray with us and also consider an END OF YEAR CONTRIBUTION. 1. There are two villages we are praying about purchasing land and building a church. Pastor Santos has been working in these villages for a couple years and it’s time to take the next step. 2. The school in Pascuala had an amazing year and finished strong with their first ever graduation. We need sponsors for the children as well as monthly support for the school. We would like to open up a couple more classrooms and hire a couple more teachers. 3. We are also praying about purchasing a lot close to the school in Pascuala and get our agricultural class started there as well as some vocational training. 4. We continue to pray about starting a 4th location for our Pastor/Leadership training. In April of 2017 we will graduate the classes in Choluteca Honduras and Chinandega Nicaragua. Our prayer is to start back in May with young men and women that are surrendering to the call to full time ministry. PLEASE CONTINUE TO PRAY FOR PAM AND I AS WE BEGIN OUR 17TH YEAR OF THIS AMAZING JOURNEY. For whom so much is given the same is much required….when I awoke this morning my home town, Gatlinburg Tn literally was on fire. The home/motel that I was raised in, we are not sure if its even still standing. In talking to my sister and Aunt from Gatlinburg, our family is all evacuated and safe. I have been watching TV stations from Knoxville, and understand this fire is huge and effects thousands of people. Tomorrow beginning at noon I will have a truck located at the Seventh Day Adventist Church on 460 east Bonsack area collecting supplies to support the First Responders that are fighting this great tragedy. The TV station requested the following items for the First Responders: Gatorade, protein bars, hight calorie candy and candy bars, work gloves, Chapstick, sanitized wipes, nonperishable snack items. Please lift these First Responders up in prayer as the majority of them have been fighting fires in other areas for days! What is LOVE…..Love can only be understood from the actions it prompts. When we bear with the failings and weaknesses of others, divine love reveals itself (Ephesians 4:2). At all costs, this love compels us to give so that we alleviate the suffering of others. Instead of seeking to fulfill our emotional and physical needs (receiving), we humbly give of ourselves (1 Peter 3:8–9). Once we receive Christ as our personnel savior we become part of the Family of Faith. All through Jesus life on earth he demonstrated to all how we should live. He taught about how we should treat others and care for others. I’m calling on the Family of Faith to be the hands and feet of Jesus. Blessings from Somotillo, Nicaragua……. I wanted to give you a heads up on an event that is going to take place by the Latino worship team from Liberty U that served with BWCM here in Somotillo last year. They are doing a concert at FBC Roanoke on Oct. 9th at 6pm. 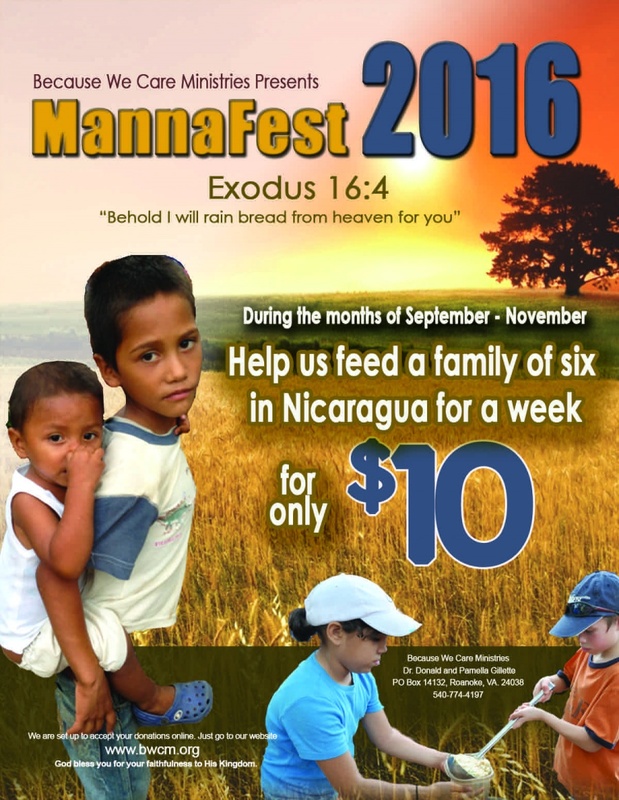 Libertad is partnering with BWCM to promote "Manna Fest" through their concerts and love offering during the months of Oct. and Nov. I would greatly appreciate it if you would get the word our to your church family and friends. I would also like to extend a personnel invitation to all the "Family of Faith" in the Roanoke area. So very excited by what God is doing through Libertad, Dr Gary Mathena, Dr Leon Neto and Because We Care Ministry. 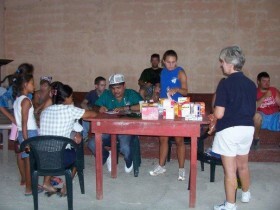 Please pray about helping BWCM provide food to families in and around Somotillo during Christmas. 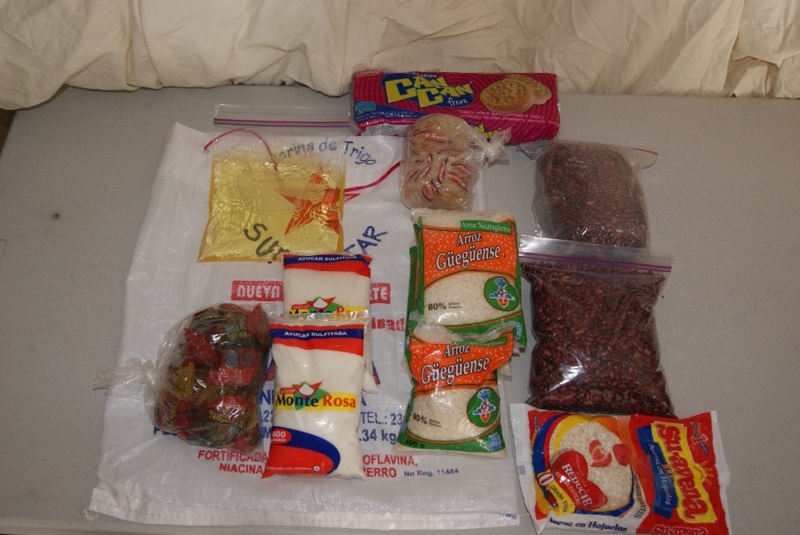 For a $10.00 dollar donation we will prepare a bag of food (picture) that will feed a family of 6 for a week. Please go to our web site, (bwcm.org) and donate.